Here you can find edifying and empowering Bible studies written by Evangelists Reinhard Bonnke and Daniel Kolenda. You can find a selection of their multi-part studies here or you can register to receive the latest study right in your inbox about every two weeks! 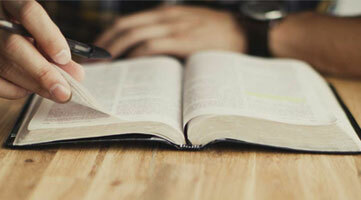 With decades of combined ministry, both have been able to perfect many messages on evangelism, but also it has given them insight into how God works – particularly in the areas of faith, the Holy Spirit, and discovering God’s will. You will be blessed as well as challenged by each of these studies. 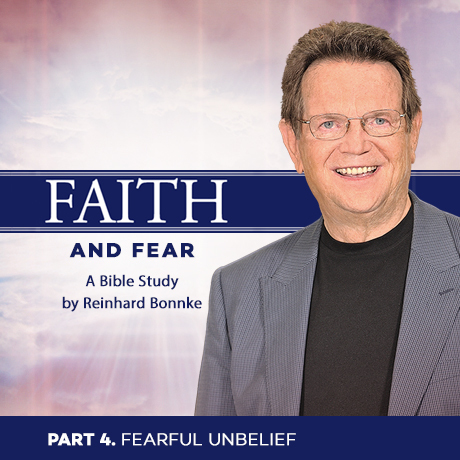 This is fresh manna from the throne and we encourage you to prayerfully study along with both Reinhard Bonnke and Daniel Kolenda and to share each insightful study with those you know. God is all knowing and all wise. He knows the future. He knows the past. He can see what is ahead in your life and in the lives of everyone around you. He knows what is going to happen in the economy, in politics, and on the world stage. When He speaks, He is giving you insider information for your advantage, and your obedience is the most profitable thing you could do for yourself. Obedience to the call of God is about following Jesus. If you have heard the call of Jesus and you think you need to be on the next plane to the mission field, then you probably misunderstood what He said when He called you. He probably didn’t say, “Go and do.” He most likely said, “Come and follow.” Don’t worry about the commission. It will come as you follow Jesus. Whenever I hear people use these excuses, it reminds me of when God called Moses in Exodus 3. The Lord appeared to Moses in a flame of fire out of the midst of a burning bush and said, “Come now therefore, and I will send thee unto Pharaoh, that thou mayest bring forth my people the children of Israel out of Egypt” (v. 10). Immediately Moses’s mind filled with excuses—all the things he didn’t have and couldn’t do. This is one of those excuses that sounds so spiritual. Please don’t misunderstand me. I’m not saying there is never a legitimate reason to wait on the Lord. But remember, we use excuses to soothe our own conscience, and the more sincere they sound, the better. Yes, there might be a legitimate time to wait on the Lord, but this can also be, and often is, nothing more than an excuse not to do what we already know to do. Jesus said, “Seek, and you will find” (Matt. 7:7, nkjv), and this is especially true of excuses. If you are looking for an excuse, you can always find one. Some people are too young. Some are too old. Some are not smart enough. Some are not experienced enough. Some are not privileged enough. Some don’t have enough money. Some don’t have the right abilities. For some it’s not time yet; for others it’s too late. 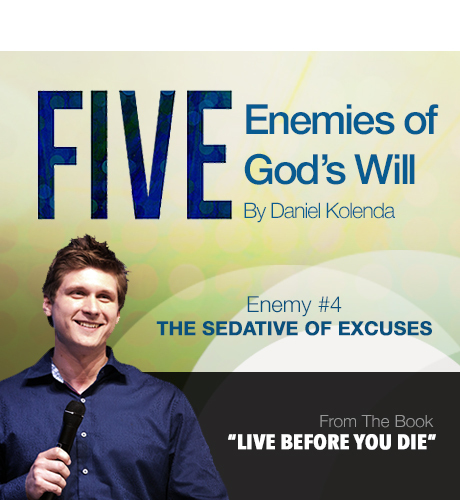 Excuses are a penny a pound, plentiful and cheap—and God does not buy them! Faith is not a feeling. When danger comes, fear is inevitable. When our bodily chemistry sets up a sense of impending disaster or we suffer heavy blows and our circumstances are oppressive and dark or when pain and illness sit with us at the fireside—fear and alarm come as a natural cause and effect. What then does faith do? It takes the shackles from our ankles, and we challenge their paralyzing grip and go ahead anyway. With God, fear will not stop us. We overcome. The New Testament usually uses only one Greek word for fear, phobeo. Jesus said, “Do not have phobia, have faith.” Jesus had no room for cowards. He said, “Do not fear those who kill the body but cannot kill the soul. But rather fear Him who is able to destroy both soul and body in hell” (Matthew 10:28). Nobody adds anything to his or her life by unbelief. It is a dead negative. Faith particularly acts against the fears that populate the future and cause a thousand other fears to haunt us. We either fear God or we fear everything else.